Food Costs > How Much Does Fudge Cost? How Much Does Fudge Cost? Fudge is known as a very popular, sweet, and extremely rich Western confectionery made of candy, butter, and milk (some people may substitute milk with cream, though). Unlike other favorite sweets, which have been existent for eras, the original American fudge is a relatively new invention, dating back only to the late 1880s. Fudge can be found almost anywhere, but high-quality fudge made fresh from the best ingredients is usually found in touristy areas such as Mackinaw Island in Michigan. How much does fudge cost per pound? The cost of fudge is going to depend on the flavor, the company creating it, and the amount needed. On average, plan on spending at least $1 to $2 per ounce. If the fudge is going to be purchased by the pound, the costs will be around $7 to $20. Your pure chocolate and vanilla slabs will be your cheaper option, whereas your fudge with candy and premium toppings can cost up to 40 percent more. Highly rated fudge on Amazon.com, for instance, sells for $14 to $20 per pound. At Mosfudgefactor.com, for example, the cost of their fudge is $8 per half a pound. Some of their flavors, according to the website, include chocolate, peanut butter, chocolate walnut, maple walnut, chocolate coconut and sugar-free chocolate. LadyFudge.com also lists her prices on her website, with most of her flavors, such as peanut butter, chocolate and cherry, retailing for $7 per pound. Fudge can come in just about flavor imaginable. Just like candy, the flavors can range anywhere from a simple piece of chocolate, peanut butter to coconut to something as odd as the butterbeer fudge at Universal Studios. Specialty fudge can also be topped with candy such as M&Ms, peanuts and cinnamon. The average piece of chocolate fudge, about 17 grams, will have 70 calories, 1.8 grams of fat, 13 total carbohydrates and 12 grams of sugar. However, these numbers can greatly vary if additional candy or flavors were added. If you purchase the fudge in person, most places will allow you to pick out the amount you want. Whether it is a one-fourth of a pound or a full pound, the fudge will already be cut into one pound pieces. After a slab is picked out, it will be wrapped in a wax paper. An article on suite 101 explains how fudge is made: “First, the ingredients, which are made to an original recipe dating from 1830, are mixed and heated to over 230 degrees. The molten liquid is then poured onto a marble slab and turned and flipped with a spade-like tool while wall-mounted fans blow cool air onto the fudge to help it set. 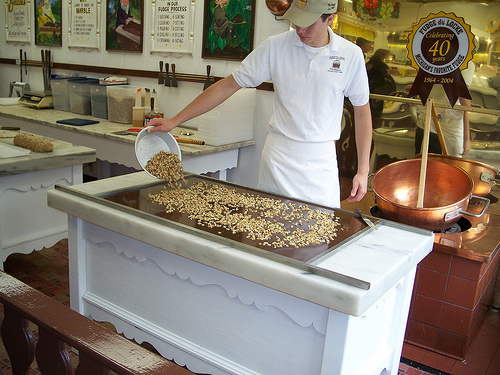 The fudge maker then changes to smaller paddle-like tools used to shape the fudge, turning all the time towards the center of the slab until the mixture hardens. Eventually, it is shaped into a humped sausage-shape and is then sliced up and served in the front of the shop. What results from all this flipping and cooling is an intensely sweet, buttery taste, the texture slightly crunchy on the outside and as you bite into it, a soft fudgy consistency in the center. It has a similar effect to an oozing chocolate brownie – gloriously decadent and persistently moreish. Due to the sensitivity of the fudge, most online retailers will want to ship it within 24 hours. Shipping should not cost any more than $10. If you are attempting to make fudge at home, do not get frustrated if it does not turn out the first time. It can be hard to master the making of fudge and it might take a few tries. Where there isn’t a set shelf life for fudge, it can stay fresh if you properly store it. In general, keep it in an airtight container at room temperature to keep it fresh for one to two weeks. If you were to refrigerate, you may be able to extend its shelf life up to three weeks. In most cases, fudge is gluten free since the raw ingredients used to make it contain butter, sugar, milk, but when it’s flavored, it can become non-gluten quickly, depending on the ingredients they are using. So with that being said, it’s best to ask about every ingredient inside to make your own assumption, but if you want to play it safe, then it’s best to stick to a strictly homemade piece of chocolate fudge. Most often, quality matters. Fudge may be more expensive in one store because it has established itself for producing top quality or tasty products, making it well worth your money. Look for coupons or special offers, especially if you live in a touristy area. These areas often have easy-to-find coupon books with coupons available from popular fudge companies. In some cases, the more you purchase at once, the more you can save.